If you’re charged with taking out the trash in a six-story office building, checking each can would take most of a your shift. But a startup, Hygiea, led by an Arizona State University engineering graduate student is taking the waste out of waste management with “smart” trash bins, according to an article on the ASU Now website. Hygiea has created a smart sensor that can be mounted on any kind of trash bin. 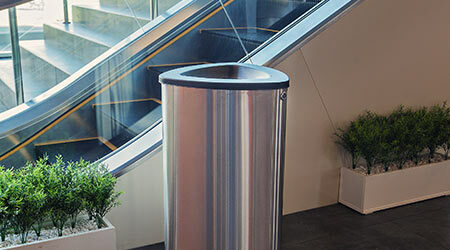 The sensor detects how much trash is in the can and sends the information to a connected maintenance worker via an e-dashboard. Hygiea is one of five finalists selected for the 2018 ASU Innovation Open on Feb. 2, where five teams of student entrepreneurs will vie for $100,000 in seed money. “What we are trying to do is make waste management efficient, so it is more focused towards the janitorial space where you have all your workers coming to collect your trash cans on an hourly basis or every three hours,” said Hygiea business development manager Surya Iyer, who is pursuing a master’s degree in management of technology. “With our sensors, if you are the head of janitorial services for this building, you could see on your mobile that, OK, this trash can is full and you can ask your janitor to go and collect it. It’s more about making the network more efficient at this moment,” Iyer said in the article. Hygiea has already snagged tens of thousands of dollars in funding from entrepreneurial competitions.